A former Kansas legislator who was the Republican nominee for governor in 2006 is running for the office again. Former state Sen. Jim Barnett is appealing to Republican voters who are upset with GOP Gov. Sam Brownback and his now-ended tax-cutting experiment. The 62-year-old Barnett is a Topeka physician and is launching his campaign for the Republican nomination with a Tuesday morning announcement in his hometown. 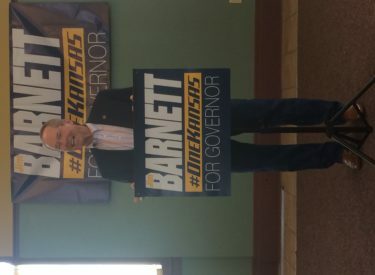 Barnett made his way to Liberal on Wednesday morning to make his announcement at the Rock Island Depot. Barnett said during an interview that bipartisan legislative majorities showed courage in overriding Brownback’s veto of a measure that will increase income taxes to raise $1.2 billion over two years. The new law rolls back past tax cuts championed by the governor. He also supports expanding the state’s Medicaid health coverage for the poor.